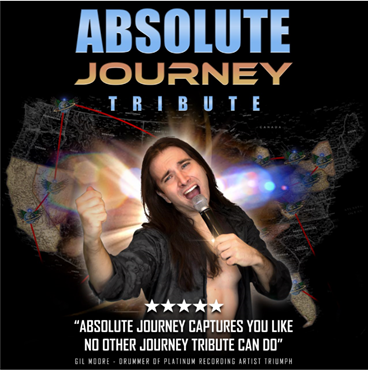 Absolute Journey is the most travelled Journey tribute in the world, performing at festivals, theaters, casinos, corporate events and on cruise ships all year long. Why international? Because they literally go everywhere: as of today Absolute Journey visited 16 States in the USA, 6 Provinces in Canada and our popularity is expanding overseas. The band recreates not just a show, but a full-fledged Journey concert, where accurately executed melodies pair up with exciting audience interaction. Riccardo Curzi will mesmerize you with unmatched vocal prowess and emotionally charged renditions that will make you swear you are hearing Steve Perry himself. Paul Mulley’s ripping solos will help you appreciate Neal Schon’s earth shattering guitar moxie once again. Are you ready for a once in a lifetime trip down memory lane?